Big B and SRK come together once again! Amitabh Bachchan - fever and an inflamed chest. Amitabh Bachchan will be seen as a genie in "Aladin"
Amitabh Bachchan feared with English grammar. Amitabh Bachchan and Rekha Again!!! 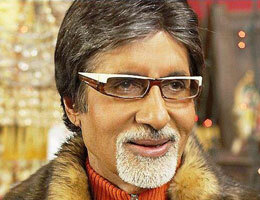 Amitabh Bachchan again on television ? Big B loses luggage, for the 18th time! Amitabh Bachchan and Rekha Again! Mumbai: Bollywood megastar Amitabh Bachchan's mother Teji Bachchan (93), who has been in Lilavati Hospital here for sometime now, was shifted to its intensive care unit (ICU) after she took seriously ill on Wednesday, according to hospital sources. "Teji Bachchan has been kept by the family at the hospital for almost a year now to ensure good nursing. She became serious today morning and has been kept under observation in the ICU," hospital sources said. Members of the Bachchan family visited her in the hospital, sources added. Bollywood legend AMITABH BACHCHAN is furious about a new list of India's biggest taxpayers - insisting he should be top. The actor - dubbed The Big B - insists he personally pays a staggering 155.9 million Rupees ($3.78 million/GBP1.9 million) a year in income tax, more than fellow actors Hrithik Roshan and Shah Rukh, who were listed above him in the Indian rich list. Bachchan, 64, says, "I'm surprised by the report and I've serious doubts about its authenticity. Because my name isn't mentioned anywhere among the top most taxpayers of the entertainment business. This gives the utterly false impression that I make pots of money and don't pay up enough taxes." The icon adds that since the marriage last month (Apr07) of his son Abhishek Bachchan and Bollywood queen Aishwarya Rai, his family pays even more money to the Indian government. Bachchan adds, "Abhishek Bachchan has paid 47.5 million Rupees ($1.15 million/GBP575,000). And now that Aishwarya Rai is a part of the family, approximately 50 million Rupees ($1.2 million/GBP600.000) tax money has come from her. This makes it a total of 253 million Rupees ($6.15 million/GBP3.07 million)." Actor Amitabh Bachchan is likely to offer a tusker to Lord Guruvayoorappan during his family's visit to the temple in February. His son Abhishek and fiancee Aishwarya Rai, the hottest Bollywood pair who were engaged on Sunday, will accompany him to the well-known Sree Krishna temple. Bachchan's wife, Jaya, will also be present. However, when contacted, Thrissur Collector and Guruvayoor Devaswom administrator M Beena told this website's newspaper no application for the offering, known as nadayiruthal, has been received from the actor so far. As per the temple rules, a veterinary expert committee has to examine and clear the elephant for the offering before the Devaswom Managing Committee puts its seal of approval. An elephant costs upwards of Rs 10 lakh. "He sat on a ramrod rock hard chair with a simple wooden table on which he wrote. He always had a glass of hot water on the table. Every time his fingers ached after hours of strenuous writing, he dipped his fingers into the glass and then continued writing all over again." "One morning during his walks, he saw a huge boulder along the way. He decided that he had to take the boulder to his doorstep one day. It was an unexpected and impossible feat for a frail man like him. He decided to use his mind and move the boulder a few steps ahead everyday. It took him months but he did not stop his efforts till the boulder reached his doorstep one morning to the surprise of his entire family"
"His popularity and adulation among the massive crowds was unbelievable. My popularity for whatever it is worth is nothing when compared to his. He was a real big star. His resonant voice and the sound of the applause of the people still reverberates in my ears,” he said…"
Big B also talks about the time when his father came back home from England after completing his Phd and instead of presents gifted the family 300 pages of the draft of his thesis all written in pencil in his own handwriting. PANAJI: Bollywood icon Amitabh Bachchan got an interim relief in a tobacco related case with the district and sessions court here staying the orders of the Judicial Magistrate that had asked him and four others to appear in the court. Bachchan was summoned in connection with a case filed by National Organisation for Tobacco Eradication (NOTE) alleging violation of central and state tobacco laws following display of a hoarding, which showed the Big B with a cigar.However, the district and sessions court stayed the order on Wednesday. The revision petition against the order was filed by Amitabh Bacchan Corporation Limited (ABCL) praying that pending hearing and disposal of revision application, the process issued by the court be stayed and sought ad-interim ex-parte relief. On November 20, the court had issued summons to Bachchan, Keshu Ramsay, M/S DMS Films private limited, Mumbai and M/S Anchor Daewoo India Limited to appear before the court on November 29.NOTE had objected to display in a hoarding showing Amitabh Bacchan with a cigar while endorsing an electrical appliance of M/s Anchor Daewoo India Limited under the brand name Anchor.They had alleged that these hoardings were in gross violation of cigarettes, tobacco and other tobacco products prohibition in advertisement Act and regulations of the trade and commerce, production supply and distribution Act, 2003 and section 7 of Goa Prohibition of Smoking and Spitting Act, 1997. 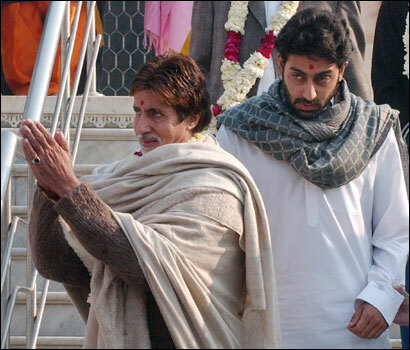 27.Nov.2006.Amitabh Bachchan is scheduled to perform a puja along with his family at a Varanasi temple Monday. Bollywood's first family is expected to arrive in Varanasi Sunday night 10.30 p.m. and will head for the ancient Kashi Vishwanath temple, said local sources. Aishwarya Rai, rumoured to be a special friend of the superstar's son Abhishek, is also expected to be part of the entourage, they added. According to local administration officials, the high-profile guests will drive down straight to the Taj Ganges hotel where 22 rooms are booked for them. A high-security ring is being put into place around the Shiva temple, which will be closed to devotees while the one-hour 'puja' is on. The 'mangala aarti' - prosperity invocation - is scheduled for 3.30 a.m. Monday. Amitabh will be accompanied by his actress-MP wife Jaya, daughter Shweta, brother Ajitabh and Samajwadi Party general secretary Amar Singh.The Varanasi administration was tight-lipped about the visit... ... until the news leaked out Sunday morning. Strongly refuting the lately-perpetrated speculation on his return to politics Amitabh Bachchan says, "I'm not into politics at all of any kind. There's absolutely no question of my going into politics. I've repeatedly said I don't understand politics, nor do I have any wish to get into it in any capacity. Let me say once and for all I'm not going to get into it . I don't make any political statements. Nor am I on any political platform. I'm not qualified to understand or participate in any of our politics." But then what about Amar Singh's statement to the effect that the Big B might be asked to stand elections? "Ask him why he said what he said. Why are you asking me?" reasons the Big B calmly. The Big B admits that perhaps his close association with politicians who are his friends, often leads to the belief that he is going the political way. "I agree I've many friends who are heavily into politics and affiliated to many different parties. But I do not follow any of their political ideology. You are also my friend. Does it mean I might take to journalism? Or would it be right to presume that you'd become an actor just because you know me so well?" While the speculation on Tuesday ran rife after a close family- friend Amar Singh alluded to the Big B's return to politics, the actor was busy shooting a music video for his forthcoming release Baabul. “The video is woven around my song Kehta hai babul. I think they'll use my song only in the credit titles and the end titles…or maybe a portion in the background." 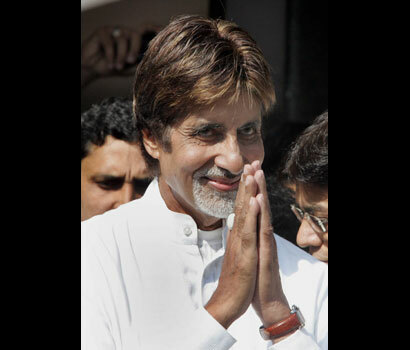 About the controversy surrounding Abhishek receiving the Yash Bharti award in Lucknow , the Big B responds, "Achcha hai. There should be debate and questioning in any free society. We're a democratic country and everyone is entitled to an opinion." The film, based on an ancient Sanskrit epic will be directed by Ravi Chopra who earlier directed the very successful TV series Mahabharat that spanned 94 episodes over a two year period in 1988 and 1989. The series was one of the biggest television hits in Indian broadcasting history. "No one can be better for the role of Bhishma Pitamah than Amitabh Bachchan," Ravi Chopra told Star News. Mukesh Khanna who impressively essayed the role of Bhishma Pitamah in the TV series has expressed satisfaction that the big screen role had gone to India’s most accomplished actor. Rani Mukherjee is widely expected to be cast as Draupadi. Yesterday, in a press conference at Varanasi when Mukherjee was quizzed on the possibility of her being cast as Draupadi, she refused to confirm the news but significantly enough did not refute it. Other cast members are yet to be decided. Indeed, Ravi Chopra in his conversation with Star News warned that the film was as yet in its early planning stages and it would be premature to get into any further casting details. Considering the fact that the film is budgeted at 100 crores the rest of the cast may well include many other leading Bollywood stars. The film is expected to feature special effects that Ravi Chopra says will rival those produced in the West. "The film will be made with great special effects like those people saw in The Lord of the Rings," he told Reuters recently. Megastar Amitabh Bachchan ’s passion for singing is not new. But it seems he is taking it more seriously now than ever. After lending his vocal chords to the theme song of Ravi Chopra’s upcoming movie Babul , Big B is now singing for Ram Gopal Varma’s Nishabd . And this time, Big B will be singing to the tune created by musician-turned-filmmaker Vishal Bharadwaj , who is said to be especially called by Ramu to compose a song for Mr. Bachchan. Vishal has already rendered melodies in Ramu’s ‘Satya’. In Ramu’s words, Vishal was “the best person to bring in a mood-driven theme” to the otherwise song-less movie. The lyrics of the song, entitled ‘Rozana’ (Everyday), are penned by a young poet Munna Dhimani. According to Vishal, it is difficult to classify the song in any particular genre.Ramu wants to start a new trend in Bollywood by releasing this track only from the film. Meanwhile, after completing the recording of the song Vishal wants to make a film with Big B. How we wish, it would happen. November 09. 2006.London: Fans of popular game show Kaun Banega Crorepati are in for a treat with its host superstar Amitabh Bachchan saying that 24 more episodes are in line. "Twenty-four episodes from the previous lot are pending. Now we are talking to the Star TV how we can complete these episodes. It will be done," Bachchan, who was here as the brand ambassador for IIFA said.Asked how soon the serial would be resumed, 64-year-old Bachchan said it was up to Star. "They are working it out. "He said Sarkar II was in the making and he, his wife Jaya and son Abhishek will feature in Pradeep Sarkar's Parineeta. About his role as Gabbar Singh in Ram Gopal Varma's proposed remake of Sholay, Bachchan said "It is a challenging role. Let us see." With Bollywood planning a string of remakes and some eminent personalities criticising the trend, the actor said "we can't stop people from criticising. At the same time we can’t say it should not be done. Remake of any film will add to creative enhancement. Whether it is good or bad is a different matter." Asked about his views on parallel cinema, Bachchan said "I don't believe in parallel and artistic cinema. Cinema is Cinema." On whether he planned to set up a film Academy, Bachchan quipped "I don't have the acumen to start an academy. I am barely managing to be an actor and I would like just to keep it to that." Emphasising his role as brand ambassador of IIFA, Bachchan said "I have come to talk about it, propagate the movement. It is good for the film industry and good for India. It is good for the host nation. It brings cooperation and brings communities together." He said he was happy that IIFA has been somewhat responsible for increasing interest in Indian cinema outside Indian shores. "I hope it continues and we want IIFA to grow bigger and greater and bring about coordination and cooperation between the host countries and ours. Hopefully we will see it being quantified in the years to come." About ABCL, he said it was "functional and operative." 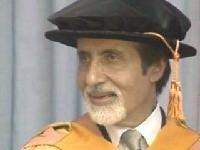 Mumbai: After receiving his honorary doctorate from Delhi University, Amitabh Bachchan relived his student days. He said that the event brought back a "surge of memories". "I was there in Delhi with my entire family Jaya, Abhishek, Shweta, my son-in-law and Amar Singhji. This is my third doctorate and given to me by the vice-chancellor. The first was from Jhansi University and the second at De Montfort (in Leicester)," Amitabh said. "It was nice being on the Delhi University campus on Saturday again. I went there after a very long time. I do keep going now and then. Lots of changes have happened. A whole contingent from the college was there cheering. It felt really good," said the star that caught the acting bug during his undergrad days in Kirori Mal College. Reminiscing on his college days, Amitabh said: "I look back with great affection at my college days. After the regimented life in school and the discipline observed by your parents in the house, college is very liberating, just attending classes, relaxing in the canteen, going off to see movies. There's a freedom of choice of thought and you can use your time as you want. "I bunked classes to go to the movies, stood outside girls' colleges and got into buses with them. When I mentioned this in my speech in Delhi, there was loud jubilation since 50 percent of the students were ladies. (Delhi chief minister) Shiela Dikshit, who was present, enjoyed that. Amitabh wished to act in plays. He said that he always acted in plays in his college days.” Acting was always an abiding passion. I was always in plays in college. I did my father's Hindi translations of Shakespeare. I miss watching theatre. I wish I had time to watch plays now. I'd love go back on stage. But it's a frightening thought." Each character in Ram Gopal Varma Ki Sholay has been redefined with a new film concept environment design roped in for the remake of the cult classic. “With Amitabh Bachchan playing Gabbar and Ramu's realism, it required great detailing,” says publicity designer Rajeev Chudasama from Green Thumb Studios who has been roped in for the movie. Tuesday, November 07. In a recent development mega star of Bollywood Amitabh Bachchan and his brother Ajitabh Bachchan moved to HC against the orders of IT authorities MUMBAI: Amitabh Bachchan, the star of the millennium and his brother Ajitabh Bachchan moved to Bomaby High Court in order to challenge a reassessment order by Mumbai Income Tax Authorities. On behalf of star and his brother a company called Lotus Investments, which is owned by them, on Monday moved the Bombay high court challenging a reassessment order passed by Income Tax authorities early this year seeking recovery of Rs 2.53 crore. Actress Jaya Bachchan is one of the directors of the company while the Bachchan brothers own the entity, IT department's lawyer Benny Chatterjee said. According to Chatterjee, IT department wanted to reassess the tax paid by the company since 1994, alleging the company was not eligible for exemption of tax on the interest it has paid on loan which it took from Vysya Bank (now called ING Vysya Bank) in 1994. According to the Income Tax department, the money was supposed to be used for business purposes but it was invested in shares of other companies. Hence, exemption granted for the interest paid on the loan taken for the expenses incurred by the company itself would not be applicable, the department stated. The company had also claimed Rs 14 lakh depreciation which it should not have done so, IT counsel claimed. Arguments are being submitted by both sides and Justice H L Gokhale and Justice J P Deodhar are expected to pass an order next week. New Delhi, Nov 04: Delhi University (DU) on Saturday honoured Bollywood icon Amitabh Bachchan, Delhi Chief Minister Sheila Dikshit, cartoonist R K Laxman and prominent scientist C N R Rao with honorary degrees. This is the first time that the institution conferred an honorary doctorate on a film personality. Amid thunderous applause, DU Vice Chancellor Deepak Pental conferred the `honouris causa` degree to Bachchan, Dikshit, Laxman and Rao, the Scientific Advisor to Prime Minister, for their exemplary contribution in their respective fields. Industrialist Ratan Tata, historian Romila Thapar and writer Mahashweta Devi, who were also chosen by the university for conferring the degree, could not make it to the function. Receiving the degree, a nostalgic Bachchan, who studied in capital`s Kirori Mal College in the mid-sixties, said it was at the DU where he first received "serious" encouragement as an actor. "It goes without saying that there is a palpable nostalgia...About the hours spent at the coffee house, at the bus stop outside the Miranda, yes, yes, always outside the Miranda House," Bachchan said as audience erupted into a huge laughter. Miranda House, a prominent women`s college in the capital, is situated near Kirori Mal College where Bachchan studied B.Sc (general) programme. It was a sudden treat for devotees at Varanasi ghat early Sunday morning as Big B Amitabh Bachchan was in the holy city to shoot for his ad film. The Delhi University (DU) will confer a honouris causa degree on Amitabh Bachchan at a special convocation on November 4 for his contribution to the Indian film industry. Noted cartoonist R K Laxman, Principal Scientific Adviser to the Prime Minister C N R Rao and Delhi Chief Minister Sheila Dikshit will also be presented the degree at a special convocation on November 4, a DU officials said.These awardees will be presented the degree in recognition of their work in their fields. The university will also honour historian Romila Thapar, industrialist Ratan Tata and prominent writer Mahashweta Devi at the convocation to be held later, officials said. Bachchan who was recently conferred a honorary doctorate by the De Montford University in Leicester, completed his three-year B Sc degree in 1967 from Delhi University’s Kirori Mal College. The remake of Sholay planned by Ram Gopal Varma (RGV) is drawing a lot of flak. But then knowing RGV he is probably looking upon the criticism aired in the media as just free publicity. Hema Malini, the quintessential village lass Basanti in the original Sholay, is not pleased with the remake of Sholay. She unabashedly told Star News, "...(Sholay) has to be seen many times. Not made many times." Equally unabashedly, and with a lot of duplicity, she also told Star News that the role of Basanti in the remake should go to her daughter Esha Deol, something that RGV appears to be resisting. Ram Gopal varma acknowledges that he shoulders a grim responsibility in filming a remake of Sholay but asserts that he is upto the challenge. Somewhat speciously, he claims that he is eminently qualified to produce the remake because he is the biggest fan of the film, having seen it 27 times within the first year of its release! He claims that his imperative for the remake is to cast the story in a new light, "I just want to see it in a new light." Lata Mangeshkar, who sang the catchy number Haan Jab tak hai jaan...jaane jahan...main nachoon gi, that preceded the climax in the original film was dismissive about RGV's attempt to make Sholay. Speaking largely in jest she said, "I hear there will be a remake of Sholay. It is a film that should not be touched. I will say that if you stick your hand into burning embers (sholay) you will simply burn it." Amongst those associated with the making of the original Sholay, Amitabh Bachchan is perhaps the only one who shares RGV quixotic quest for a remake. Bachchan who will play the role of Gabbar Singh in the remake, is on record stating that he has always wanted to play Gabbar Singh. "We are not making the film to compete with the original. We are doing it to express our creativity", he said recently. "Artistic liberty may be expressed in any form that the artist pleases." The use of we, instead of I, is a clear indication how closely Amitabh identifies himself with the remake. The fact is, Amitabh owes RGV a lot and his involvement in the Sholay remake could well be a payback for the blockbuster Sarkar (2005) and the forthcoming Sarkar 2, both films handcrafted by RGV for Amitabh and his, still not quite on his own, son Abhishek. While Amitabh makes his point about artistic liberty well in doing so he unwittingly acknowledges the abject bankruptcy of Bollywood's film making. A bankruptcy that forces stalwarts like him to act in pathetic self serving remakes by producers like RGV, rather than scale new heights with filmmakers ready to push the envelope in a manner that forces Bollywood to snap out of its collective mind block. OCTOBER 15, 2006.NEW DELHI: Many see Amitabh Bachchan as a materialistic and overexposed actor who is not ready to sit on his laurels but works relentlessly to build a larger-than-life media image never seen or heard before in Bollywood. The actor, who rules both the small and the silver screens, has entrenched himself so deeply in the endorsement arena that he is giving the King Khans a run for their money. According to media reports, Bachchan’s take home last year was around Rs190mn ($4mn), far more than mega star Shah Rukh Khan’s who earned Rs130mn ($3mn). Khan’s earnings include his endorsement deals for Pepsi, Hyundai Santro and Lux. What really sets Bachchan apart from other ageing big stars is while most have faded into oblivion or been reduced to doing father or uncle roles, Big B, as he is called, rules the roost even at 64. The small screen played an important role in giving him a new lease of life. After a rough patch in the 90s, he barged into Indian homes with one of the most popular quiz shows of Indian television Kaun Banega Crorepati (KBC) and the famous BPL advertisement. There was no looking back for him since then. "We want to reinforce his image of being a global brand and also as the most saleable face of India. He has about a dozen endorsement offers," Sunil Doshi, CEO of Alliance Media and Entertainment, the company that manages Bachchan’s endorsements, was quoted as saying when the second season of KBC set rolling. It won’t be an exaggeration to say that Doshi has surpassed his own expectations with Bachchan becoming one of the most commonly seen faces on the small screen. Bachchan is endorsing everything - from pens to cars to hair oils to chocolates. His reach can be estimated from the fact that he was signed as a brand ambassador for Reid and Taylor. Earlier, Hollywood actor Pierce Brosnan endorsed the product. "Amitabh Bachchan is an icon with a universal appeal and has helped us reach out to the real ‘Bharat’. While it is too early to quantify the results of our new campaign, our business associates are extremely excited about Mr.Bachchan’s association with Reid and Taylor," Tarun Joshi of Reid and Taylor said. "In fact, agents and retailers have told us that customers have started asking about the ‘Amitabh wali suiting’," Joshi said. An All-India 2005 Celebrity Track Survey conducted by Hansa Research amongst respondents aged 15-50 years ranked Bachchan at the top. Big B also topped a celebrity likeness poll for two consecutive years - 2003 and 2004. Describing his phenomenal success after KBC, well-known filmmaker Ravi Chopra, who signed Bachchan for his superhit Baghban, said: "When he was doing KBC, I think the whole process helped him and people got a feeling that he is a very genuine person. People looked at him as a fatherly figure and believed that he will not give wrong suggestions. People started to respect him so much that they started believing what he said. "And this image worked for the manufacturers. When I see an ad that has Amitji, I feel ‘he is saying it, then it must be true’. Because people look at him with so much respect." When Bachchan debuted on the small screen, the risk factor was very high because at that time he was perceived as a decaying actor, failed politician and businessman doubling under heavy debt. In spite of a three-decade long successful innings, when it came to his second innings he wasn’t getting his due in Bollywood. His larger-than-life image made him one of the most expensive celebrities endorsing brands. His endorsements apparently cost between Rs50mn and Rs120mn. Despite the rate, Indian and multinational companies make a beeline for him. The domestic brands usually opt for a short-term association with Big B. But for multinationals like Reid and Taylor or Pepsi, renewing the contract with Bachchan is not an issue. According to a report, ICICI Bank did not renew its deal with Bachchan in 2002. Maruti, which roped in both Bachchan and his son Abhishek for Versa, is lying low for a while. Many feel Bachchan is overexposed as he is endorsing too many products. But Chopra disagrees. "I don’t think he is overexposed. And I don’t believe in over-exposure. He is a damn good actor and if he is doing it in style, then it doesn’t matter how often he appears." Chopra is right because Bachchan proves his versatility in ads too - if he comes across as a suave gentleman in Reid and Taylor, his lingo and mannerisms in the Cadbury Dairy Milk chocolate ad where he proudly introduces his cow Radha as Miss Palampur is totally rustic. And he carries off both the personas convincingly.For the manufacturers, using a sportsperson is risky because their performance has a direct effect on sales. With actors there is no risk, more so with Bachchan. In short, Big B is the safest bet. OCTOBER 12, 2006. Bollywood mega superstar Amitabh Bachchan turned 64 on Wednesday. But Bachchan will not celebrate his birthday in a grand style as his mother is not keeping well. His mother Teji Bachchan is unwell and the star will be spending time with his family on his birthday. "I will be at home with the family. There will be no celebration as such because my mother is unwell for some time now," Bachchan said last week at a promotional event. But for the hundreds of fans who will gather outside the Bachchan residence ‘Pratiksha’ in suburban Juhu to catch a glimpse of the star on his birthday, this will make little difference.Every year, the star comes out in the balcony to greet his fans who gather outside to meet him from all over the country.This year's birthday celebration, however, will be more subdued than earlier years when the Bachchans held huge parties to celebrate the Big B's birthday.Bachchan's 60th birthday especially was celebrated in a grand manner where his company AB Corp was launched and a book written by Jaya Bachchan on him was released. Amitabh Bachchan celebrates his 64th birthday today and even though the actor will not be having any grand celebrations due to his mother’s illness, his die-hard fans all over India will definitely celebrate their bollywood icon’s big day. Amitabh has decided not to have a bash as his mother is unwell. However Amitabh as usual will spend the day with his family and loved ones. The start of Amitabh’s birthday saw hordes of fans gathered outside both his bungalows ‘Jalsa’ as well as ‘Pratiksha’. Many fans have been coming over to his residence since quite a few years and bring him gifts too. Even little school children were seen outside the actor’s residence holding placards wishing Big B a very happy Birthday. Radio channels began airing birthday wishes for Amitabh from common people as well as other bollywood celebs. Many people sent messages to radio channels wishing Bachchan senior and even called up on the show to personally wish the actor. Television channels too showed their good wishes for the actor by airing his films throughout the day. In some parts of the country people even prayed before Amitabh’s picture and gave charity in his name. Everywhere there were celebrations wishing Big B a happy birthday and a prosperous and successful life ahead. Amitabh too made an appearance for the people outside his home and thanked everyone for their blessings and good wishes. Nonetheless Amitabh who receives so much of public adulation and adoration remains humble and down to earth. Amitabh has been in the film industry for the last four decades and during his time in bollywood he has made an impeccable mark in Indian cinema and has even been titled ‘Legend’ and ‘Icon’. He is well known not only in India but in other countries as well. He has done several hit films in the past like Deewar, Sholay, Amar Akbar Anthony, Namak Halal, Satte Pe Satta, Lawaris, Coolie, Agnipath etc. After taking a five year break from films he made his comeback on the small screen in a television serial Kaun Banega Crorepati, the show was a phenomenal success and he went on to capture the hearts of his fans with films like Kabhie Khushi Kabhie Gham, Bunty Aur Babli, Khakee, Sarkar, Kabhie Alvida Na Kehna etc. The French embassy in India, which made the announcement on Wednesday, the 64th birthday of the film-star, said the award was also in recognition of his efforts to bring together Indian and international cultures. 'According to protocol, Dominique Gerard, the French ambassador to India will speak to Amitabh Bachchan and seek a date from him for the official ceremony during which he will be given the honour personally,' Mohamed Bendjebbour, a French diplomat told the daily. Created to reward eminent military and civil merits in the service of France, Legion d'Honneur is the highest distinction that can be conferred to a French citizen or foreigner. Among the eminent Indian personalities to have received the honour are film-maker Satyajit Ray in 1987 and environmentalist RK Pachauri in July this year. Bachchan, a national icon in India, is well known in many countries around the world. BBC Online voted him 'Star of the millenium' above Hollywood greats like Sir Lawrence Olivier and Charlie Chaplin. Bachchan, popularly known as Big B, has dominated Indian cinema since he quit his job as a freight broker in Calcutta and joined Bollywood more than three decades ago. Sixtyfour-year-old Bachchan, a Goodwill Ambassador for UNICEF, received the degree at the graduation ceremony of the De Montford University in Leicester. The university had earlier conferred a honorary degree on former South African President Nelson Mandela for his charity work. De Montford University attracts a considerable number of students from India every year. Bachchan said he was deeply humbled by this recognition. The megastar said his father Harivansh Rai Bachchan had done PhD in English Literature from Cambridge University way back in 1954 and was referred to as “Dr Bachchan” and whatever he is today is because of the academic influence of his parents on him. Amitabh Bachchan, who arrived here yesterday accompanied by Samajwadi Party leader Amar Singh, is expected to call on Jack Straw, leader of the House of Commons, and other members of the Tony Blair Cabinet tomorrow. Ash, Abhishek to enter into wedlock? It all started with an alleged visit by Abhishek’s uncle, Ajitabh, to Ash’s family astrologer, Chandrashekar Swami, in Bangalore. The venerable Swami, on his part, ratted out details like “Kundali milgayi” (the horoscopes match) and “Sheegrameva kalyana praptirasthu” (the wedding will happen) to Eenadu TV. “I have known Aishwarya’s father and mother for a long time… We come from the same village, and they consult me regularly... God willing, the wedding will happen soon,” he told ETV. Another friend claims that Abhishek has always been candid about his relationships with his friends. “When he was serious about Karisma, he told us about her,” she says, adding that “though Ajitabh visited Amit uncle in hospital, things between the two are still far from normal.” The buzz about Abhishek’s romance with Rai intensified after the duo returned from the shooting of JP Dutta’s Umrao Jaan in Jaipur. And now the two head off to Brazil to shoot for Dhoom 2. What’s going to happen in the second half? MUMBAI: Superstar Amitabh Bachchan got a CT scan and an MRI done at Nanavati Hospital late on Monday night, even as the news of his visit triggered a wave of speculation about his having to undergo another surgery. Nanavati's medical superintendent Ashok Hatolkar said Bachchan was here for "routine CT & MRI scans" and both tests were clear. The media turnout at the hospital swelled as the news of the star’s presence spread. Coming close on the heels of a report that Bachchan may need another surgery for hernia, the midnight check-up caused quite a stir Speculation didn’t subside even though hospital sources said all is well with the Bollywood icon as per the CT and MRI scans. Industry sources insisted Bachchan is scheduled to undergo another series of diagnostic tests over the weekend before the family decides on another abdominal surgery — a diagnosis that family friends and well-wishers pooh-poohed. The family lobby maintained he is fine but weak. Tirupati, Jan. 15: Bollywood superstar Amitabh Bachchan is to offer a diamond ornament worth about Rs 9 crores at the Lord Venkateswara temple in Tirumala, Andhra Pradesh, temple officials said. The actor, along with wife Jaya Bachchan, son Abhishek Bachchan and friends Anil Ambani and Amar Singh, had offered prayers at the temple on December 28 and 29 following his recovery from surgery. At that time he had offered to donate “something unique” to the lord in thanksgiving. When Amitabh told the temple officials of his intention, they suggested that he offer a diamond-studded kati varada hasthalu (diamond wrap for the hands) since the temple had only one set of them. Temple authorities told him that the ornaments could cost about Rs 9 crores. Tirumala Tirupati Devasthanam (TTD) executive officer A.P.V.N. Sarma said the board had sent the design and the measurements of the ornaments. He had sought time to make the offering, Mr Sarma said. The Tirumala temple is famous for big offerings. A Swiss devotee, Ms Elizabeth, had pledged her entire property, worth Rs 5 crores, to the TTD in memory of her husband in June last year. She requested the TTD to perform Tiruppavai and Abhishekam one day in the month of December every year. During a recent visit, Tamil superstar Rajnikant had promised digital screens worth Rs 1 crore to the TTD to display information. Many of those donating huge sums prefer to remain anonymous. An unidentified devotee offered a one-kg gold satari (used to bless devotees after giving theertham) in December last year. In the same period, another pilgrim gave a Rs 1.40-crore diamond-studded gold face mask which had 1.5 kgs of gold. A diamond necklace worth Rs 15 lakhs was given by a Delhi-based businessman in November last year. On December 19, an unidentified devotee offered Rs 20 lakhs. In many instances, devotees deposit large sums of cash in the hundi. At other times, the anonymous offerings are of diamond-studded jewellery and, in one case, a diamond crown. The TTD’s Anandanam scheme is run with interest on Rs 150 crores in deposits (by July 23, 2005) donated by devotees. The scheme, which costs about Rs 1 lakh on average, feeds 15,000 devotees on ordinary days and 30,000 devotees on peak days. The TTD pranadana scheme, meant to provide free medical aid for white card holders, has received Rs 3 crores from November 2005. Amitabh Bachhan, is upset about being treated like any other Indian. As Big B lay in his hospital bed with abdominal pains and images of bad films and over-acting (majority of his endless career) racing through his brain, he was allegedly approached by an IT official who had the temerity to remind him of tax arrears. 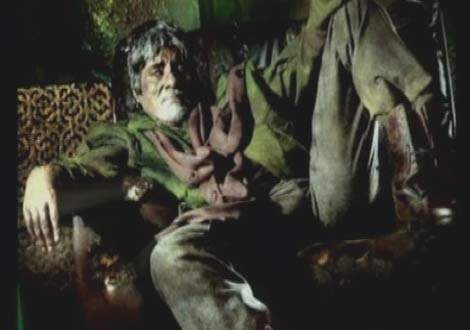 Like any other rich Indian, Amitabh was incensed by being asked to pay taxes and that too while he was genuinely sick. Our man Sheru tracked down the offending IT official and pressed him for his opinion: "If Big B was to die on that hospital bed, it would have been extremely difficult for us to determine who would have inherited his tax problems. And we are not talking small change here either: Amitabh's tax arrears could've saved several lives as he himself battled for his own. I guess thats not something Big B likes to think about." But with friends like the entire UP government, Amitabh would not lie down quitely. As any self-respecting crore-pati would do, Big B has also chosen to complain about 'aam-aadmi' treatment accompanied with accusations, that in our assessment, are products only of his gut-feelings albiet very sore gut-feelings. Sources close to Big B (is that a grade for his acting/movies?) say that the actor defaults on taxes every fiscal year as he considers it his bollywood-right to do so. Afterall, Bollywood and Black Money go hand-in-hand, singing and dancing in the gardens of mediocrity. NEW DELHI: When Amitabh Bachchan lay in Mumbai’s Lilavati hospital recuperating from a stomach ailment that had millions of his fans praying for a speedy recovery, he had other things to worry about than just his health! The Income-Tax department chose precisely the period of his illness to slap a Rs 4.5 crore notice on him, according to sources close to the Bollywood icon. A surprised Bachchan reacted to the seemingly insensitive move by writing a cheque of the amount sought, even though he had disputed the claim before an IT tribunal. MUMBAI: If all goes well, Amitabh Bachchan will appear in his first international project to be directed by Deepa Mehta. Deepa, revelling in the immense success of ‘Water’ in Canada - the film continues to be a record-breaking grosser in its seventh week - is waiting for Bachchan's green signal. "The lead in my film 'Kamagata Maru' can be played by no other actor except Bachchan," Mehta said. "The hero of my most ambitious and expensive film has to be a man of substance, stature and wisdom. I can't think of anyone else but Bachchan," says Mehta. Meanwhile, Deepa has finalised the rest of the cast. Seema Biswas, who has received the maximum raves in the international press for ‘Water’, and John Abraham will play key roles in ‘Kamagata Maru’. Deepa has also penned in Terence Stamp, the charismatic British actor from ‘Billy Budd’ and ‘Adventures Of Priscilla Queen Of The Deserts’, to play the crucial role of a lawyer. Mumbai, Dec 17 (IANS) Superstar Amitabh Bachchan returned home Saturday after being in the Leelavati Hospital here for nearly 20 days when he was operated upon for an abdominal ailment. Wearing a white kurta-pyjama, the cheerful Big B walked out of the hospital escorted by son Abhishek and medical staff and waved to a large number of fans waiting outside before getting into a vehicle that took him home. The busy as a bee star, apparently diagnosed with a condition known as diverticulitis, has been advised a month's rest and asked to avoid spicy foods. Bollywood mega superstar Amitabh Bachchan , who is recuperating at Lilavati Hospital after a surgery for an intestinal ailment, is doing fine and fast improving, hospital sources said on Friday.Sixty-three-year-old Bachchan, who began his semi-solid nutritive food since Thursday, a week after surgery "is cheerful and doing fine," the sources said.Bachchan was admitted to Lilavati Hospital on November 28 and was operated for diverticulitis of small intestine on November 30.Meanwhile, Doordarshan has rubbished allegations that Bachchan's illness was not given "adequate" coverage by the public broadcaster. It said its news channel had given an update on the superstar's health in almost all major bulletins since his hospitalisation on November 28. "Beginning from November 28 when Bachchan was hospitalised, DD News has given an update on the superstar's health in almost all its major bulletins, including an extensive coverage on December one, the day he was operated in Mumbai's Leelavati Hospital", Doordarshan said in a statement. "It was a conscious decision by the editorial hands that while presenting news on Amitabh Bachchan's illness, we should not create any hype so as to raise unnecessary scare among millions of viewers," Amitabh Chakrabarti, the Head of DD News said. The news of Bachchan's illness was covered in 63 bulletins over a period of one week, he said. There was no effort to downplay Bachchan's illness as alleged in some media reports, Chakrabarti said. Samajwadi Party General Secretary Amar Singh had alleged that Congress President Sonia Gandhi was responsible for the "blackout of news pertaining to Bachchan's hospitalisation in Mumbai, on Doordarshan". Bollywood megastar Amitabh Bachchan, who underwent a major surgery for inflammation and perforation of small and large intestines at Lilavati Hospital in Mumbai on Wednesday, would be out of action at least for a month, hospital sources said on Thursday. 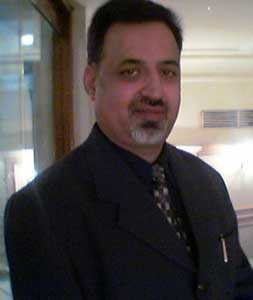 3-12-2005. Four Lucknowi kachoris, that Amitabh Bachchan had munched, during an event in Lucknow, may have caused the stomach infection, believes a source close to the actor. Bachchan was to release a documentary by poet-writer Ashok Chakradhar on the life of his father, the late poet Harivanshrai Bachchan, when he was served the mouth-watering kachoris. Bachchan, who rarely eats food cooked outside, could not resist the temptation and dug into them. “As the kachoris were pungent and very spicy, these could have caused the infection. Bachchansaab is known to have cholesterol-controlled hygienic food, especially cooked for him,” said the source.